Crocodile SF Aquatic is one of the newest Exotic Vinyl's in our Product Line. Aquatic is an ultra soft vinyl that features a baby crocodile pattern. Want the elegance and great look of real exotic leather, but don't want to pay the high price for it? Then this is the vinyl for you. 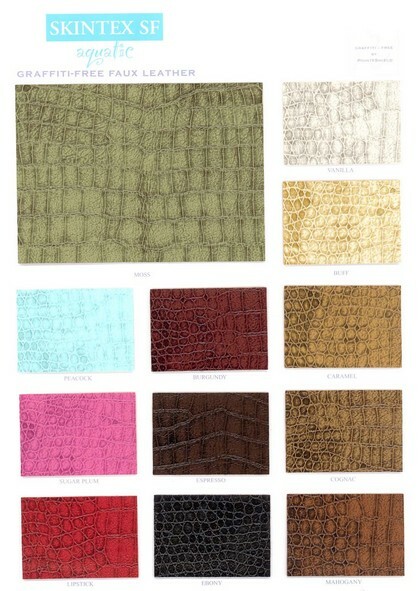 Crocodile SF Aquatic Faux Leather Vinyl's are a break-through in faux leather luxury. Available in numerous colors, these vinyl's offer an Ultra soft leather feel, yet are exceptionally strong.